Yes it is time for that big adventure! Yet another amazing year. This year we also got the honour to be visited by Morakniv. Together with Woolpower, Primus, Gränsfors Bruk and Fjällräven, Morakniv vill also be present during the High Coast Hike 2018. 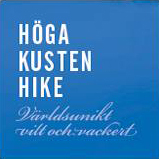 The High Coast Hike started in 2013 as a hike through the highlights of the World Heritage Site the High Coast of Sweden. Today it has turned into a hiking festival with hikers from all over the world – filled with outdoor schools, seminars, live music, after-hike and much more. The High Coast Hike 2015 was another amazing year with hikers from all over the world. This was also the year when the after-hike became a new tradition. With all hikers finishing the hike on Saturday instead of on Saturday and Sunday the celebrations became another highlight of the adventure. The High Coast Hike 2014 became the hottest hike so far. With temperatures reching the 30´s the hike was mostly carried through in bathingtrunks for fast entry into the streams, lakes and the ocean. What made us extra happy was the amount of returning hikers, something that has continued. We noticed that four hikers made their own video from the High Coast Hike. We asked if we could use it and they became really happy. Here is the result. The High Coast Hike 2013 was the start of what now has become Europes second largest hiking adventure (after the Fjällräven Classic). FriluftsByn the Outdoor Village was more of a dream than a physical place, however the companionship was – just as now – the big suprise for many hikers.